A stone on 3-4. See 3-4 joseki and enclosures. Like the 3-3 point, the 3-4 point (komoku) more or less secures the corner. At the same time, it also starts taking a look outward. It forms a kind of middle ground between the corner-oriented 3-3 play and the more outward-oriented 4-4, 5-3 and 5-4 plays. The enclosure of the corner is less strong than that of the 3-3 point, and the addition of a second stone is useful to make it more secure. A corner enclosure created like this is also often called a shimari. The most common enclosures with the 3-4 point are the small low ( in the example diagram) or the small high ( point a on the diagram). The large low enclosure (b) is also often played. It claims a larger amount of territory, but at the same time the claim itself is weaker. In some circumstances, Black prefers to stake a claim to the upper side instead with a move like c through f (of these, e is the most common). In special circumstances, enclosures might also be made at g through i. These generally denote a special strategy. Beginners might like to enclose the corner at j; this is considered too slow for high-level play, but it is the most solid enclosure based on the 3-4 point. Because the follow-up move to a 3-4 point opening is also a good move (it both stabilises the corner, claims territory and extends the influence of your stones) your opponent will often try to stop you from making the enclosure. Such an approach move is also called a kakari. The simplest way of his stopping you from playing on a certain spot is by playing there himself. Depending on the whole board position, a play on the 5-3 point is as good a kakari as your shimari on that point would have been. Several joseki can develop from this position. The reference page 3-4 point josekis lists variations systematically, with diagrams for typical results. Other obviously possible approaches are the distant low, high, or distant high ones. One thing to remember is that making a kakari such as in the diagram (from the wrong direction) only forces White to play , a move he wanted to play anyway. This is not a good idea in general, but there are still positions where it is used, for example when playing against the Chinese fuseki. Still, if there is no special reason to do so, approaching the corner from this direction should be advised against. See about the approach from the wrong direction for more on this move, and other moves on this side. 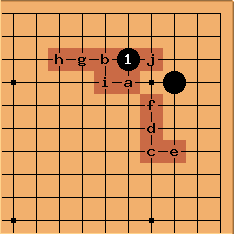 The 3-4 point has a very rich history in Go literature as it was the most common opening play in the corner throughout the classical and modern periods of Go in Japan, up to about 1975. It is the subject of volume 1 and volume 2 of the most popular joseki dictionary in English. The 3-4 play is territorially-oriented. White can no longer reasonably expect to prevent Black from making some territory here although of course Black may later give up the corner in exchange for benefit elsewhere. The 3-4 point is not symmetrical, and it leaves the corner unfinished. The question of whether Black will play next to enclose the corner with an enclosure, or White will play an approach next to claim something here, is pressing. 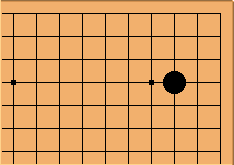 In classical games from Japanese Go history this question has tended to be resolved directly: either Black made an enclosure or White played an approach. 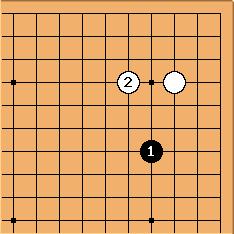 In modern Go some of the popular large-scale fuseki such as the Chinese Fuseki and Kobayashi Fuseki introduce a different concept, emphasizing the side. Rather than making an enclosure at the earliest opportunity, Black builds a larger framework designed to exploit White's approach when it comes. Here I place some comments about whole board strategy associated with 3-4 point. Komoku has a "strong" (pointed) and a "weak" (flat) side. Generally the "strong" side points towards the corner where you want to make a kakari (approach move). In effect, the opponent will want to have a stone in a corner parallel to a "weak" side of komoku. Shimari is basically a move which protects the weak side of komoku and strenghtens the influence towards the strong side.